So here you are, ready to start a new renovation project. Surely, one big thing on your mind right now is the money that you’ll be spending. You’ll have plenty of people come to you and try to increase your budget, but we’re here to suggest a few ways you might be able to save money on your project. Often your local contractors will leave smaller details out which impact costing later on, or won’t tell you the brand of material they plan to use thereby reducing your quote in order to get the project. Doors and Windows today are not just restricted to being made of wood, but are also done in UPVC and aluminum. When it comes to windows, in our experience, more and more people are opting for UPVC over wood. This post should help you get a quick sense for the plusses and minuses of one over the other. A shift from wooden to UPVC windows and doors is happening in India because UPVC tends to cost a little less and requires less maintenance over its lifetime. They are less susceptible to moisture, which also helps in our hot and humid environments. They are also fire proof and termite resistant to top it all off. Where UPVC doesn’t score well is in their design and color selection compared to their wooden counterparts. Wood is a good insulator, and therefore provides better protection from the heat and cold than other materials. Wooden windows are also eco-friendlier, given they use wood (natural) vs. PVC (manufactured) and also require less energy to manufacture. Most of all they tend to look better than UPVC windows and doors. If maintained well, wooden doors and windows tend to last longer than UPVC. On the flip side they are more expensive to make, require more time and money to maintain, and under moist/humid weather conditions show more wear & tear. For your reference, our experience suggests that the cost of wooden doors and windows is around 50% higher than UPVC. However, if you’re still looking to go with new wooden doors, you might consider reusing the existing frame (chaukhat) and save some money. If you don’t need new doors and windows you could always consider the repair option. A good carpenter can fix up your old wooden window and frame, and the painters can help paint or polish it to make them as good as new. This turns out much cheaper than any of the above. PLEASE NOTE: In both the wood based options above, please make sure you don’t have termites (deemak) in any of your other woodwork or else you risk it spreading to any new wood being brought in. Being in the business of home renovations one often gets asked for architect recommendations. One of the first things we like to ask them is what is it that you’re really looking for. Most of the times it turns out that there is little need for an architect. So we thought we’d try to explain the difference between professionals in this space. Architects are trained, certified and have a college degree (undergrad, or masters) to show for it. The main job of an architect is to conceptualise the space in terms of the structure (floor, walls, ceilings) and plan layouts. They tend to have specialists on their teams for structural evaluations, plumbing and electrical planning. If you’re constructing a new floor, or a building you need to get an architect involved to make sure the planning is sound. While its not their core skillset, some architects get involved with the interiors and take on things like floorings, walls, ceilings, and even décor & furniture. Interior designers focus on the interiors of a space. They help you make your space more livable/usable by suggesting how your rooms should look, how can you organize your furniture, what color theme you could pick for your bedroom and so on. 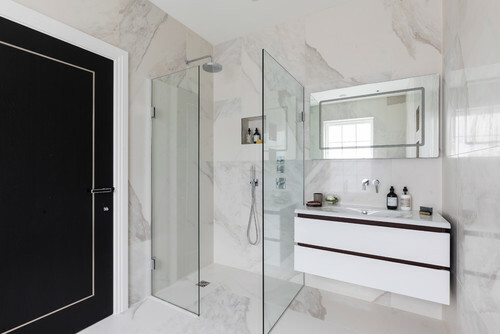 They can also help you pick things like the right tiles for your bathroom, the marble for the flooring keeping in mind the overall chosen look and feel. The contractor is the one who gets the work done – i.e. the demolition, civil, plumbing, painting etc. There is a category of contractors called the general contractors who have teams, either on payroll or as affiliates who can help execute all your requirements. Then there are specialist contractors who only execute one type of task (e.g. painting contractor). Whatever your project involves, you will have a contractor on site. Even if a designer or architect says they do turnkey projects they will be working with a contractor to execute. A project manager is someone who keeps track of your project and makes sure work is proceeding on time. It is their responsibility to firefight in case of issues, remind you when certain product decisions need to be made by, and push the contractors when their teams are not showing up on time. As with PMs in any organization, a good construction PM is an extremely useful resource during the execution of the project. While bathrooms are usually the smallest room in the house, they tend to have a lot of stuff in them and usually this leads to clutter, everyone would love a little more space in the bathroom, but most of us don’t have the luxury of a large apartments with ample square feet available. Here are some ideas on how to maximize storage space in smaller bathrooms and make them feel more functional and spacious. Use narrow cabinets to fit into wasted spaces, maximize every square inch. Add a shelf above your sink, this can be used for placing items that are needed often. Use spice racks for makeup and toiletries. Hang your towels behind the door, why waste wall space when you can use the door. Increase the hanging rod space. Stick shelving above your door, another space that is usually wasted. Maximize the area above your toilet, don’t neglect this space. Medicine cabinets are a classic space saving item, there are quite a few designs available in the market. Add a long cabinet to your bathroom vanity, if you have a little space after your sink dont waste it. We hope these tips will help make your bathroom experience more pleasant! Let us know if you have some innovative ideas to maximise bathroom storage in the comments section. If you’re tearing down and renovating a bathroom, you may not know what exactly it involves. 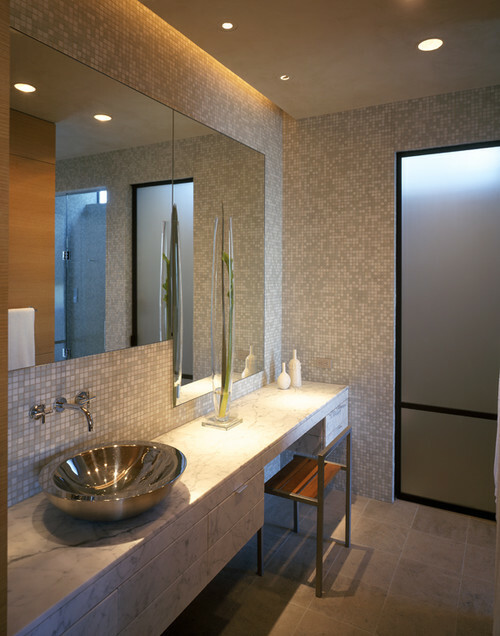 All you may have seen are bathroom designs you’ve found online and shared with your contractor. Here’s a brief checklist to educate yourself. The first step is tearing down the existing bathroom. It could be entirely internal if the walls don’t need to be moved. Specifically you may need to remove the wall tiles, floor tiles, fittings, and woodwork. Demolition always goes hand in hand with debris removal, so make sure you have someone to manage it for you (contractor or 3rd party). A well-lit bathroom makes your daily experience a lot more pleasant. Given that false ceilings are becoming common practice in the bathrooms nowadays, ceiling lighting can be considered. As for the rest of the electricals make sure to provision for a water heater, at least 1-2 open points for things like an electric razor or hair dryer, a pressure pump if needed, and an AC if you feel like splurging. Plumbing is fairly typical in a bathroom. Check your water pressure before the walls are plastered up and the fixtures are installed, so that if pipe routing needs to be adjusted, or provisions for a pump need to be made it’s a LOT easier. It is extremely critical to get waterproofing right. We recommend that you waterproof the floor and about half the height of the walls in the bathroom for extra protection. This is done before any tiles or flooring is installed. There are plenty of options out there for bathroom wall tiles. It all comes down to your choice and budget. From multiple Indian and imported wall tile brands, to unbranded ‘Gujarat’ tiles, you’ll find a lot out there. If you have storage space, buy an extra box for later (years to come). Sometimes you need to break a small section of the walls to resolve plumbing problems and matching tiles come in handy. You can use tiles, marble, or granite for your bathroom flooring. It’s not uncommon nowadays to have a false ceiling in your bathroom. Keep it simple would be our suggestion. One downside of false ceiling is that if there is some kind of water seepage from the floor above, the false ceiling will need to be replaced. Regular ceilings on the other hand are cheaper to fix. You may choose to get some storage constructed under your sink (vanity), or elsewhere in the bathroom if you have space. This comes in handy to store things like bathroom cleaners, towels, soaps, shampoos etc. Using waterproof board is a good idea to give your cabinets extra protection against moisture. You may want to put in a granite/marble counter top around your washbasin based on the type of look you’re going for. More and more people today are choosing UPVC doors and windows. While UPVC doors may not quite work out in the bathroom, windows are a good idea given UPVC is more resistant to moisture than wood and last longer. 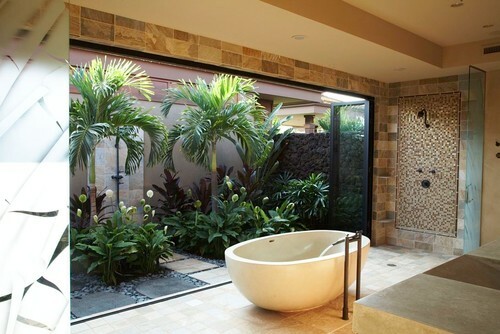 A modern bathroom today isn’t complete without a shower enclosure. It adds character and utility to your bathroom. Toughened glass is pricy, so an enclosure adds a significant expense to your bathroom renovation. Last but not the least is the bathroom fixtures, which includes your washbasin, WC, and plumbing fixtures like your shower fittings, sink faucet, and WC faucet. The pricing of these vary vastly depending on the brand you choose. Some of the brands in the market include Hindware, Jaquar, Kohler, Grohe. One of the biggest contributors to indoor air pollution in apartment buildings are home renovations. If not done carefully the dust and chemicals spread through the ducts and shafts and are able to cause damage to quite a few residents. While there is no way to completely remove this unfortunate side effect of home remodeling, there are things that can be done to keep it in check. Whenever possible, work at a time when residents are likely to be out; 9 AM to around 6 PM is a fair window. While it is tempting to maximize working hours, it starts to become disruptive to the other residents. Cover all ducts and openings in the apartment during the process, this will contain the particles and one can control the damage. Keep containers of paint and other chemicals closed whenever possible. And keep it all confined to as small an area as possible, for example if painting a room, keep the door closed and windows open so that the chemicals aren’t spreading to the other rooms unnecessarily. Get the site cleaned every day at the end of the day. Remove debris in proper containers. Also ensure that workers on site, clean their feet and clothes before leaving a site so as to not spread particulate around the area. Keep the appropriate windows open and consider putting a standing fan on site to be able to direct the air out. And finally the most basic thing to do, stay away from a work site as much as possible, if inspecting the site make sure work is stopped and the site has been ventilated. Wear a mask whenever you do visit. Definitely keep children and pets far away from site. Keep these tips in mind when renovating or share them with anyone who is planning a renovation, a little consideration will go a long way to improve the indoor air quality in your building. It is natural for homeowners about to embark on a remodeling project to have a lot of insecurities about the process. How will the final output turn out? Will the project stay within my budget? How long will it take before I can move into my new space? On top of that the noise and mess is extremely unpleasant and frustrating. So here are a few things to keep in mind that will help you deal with the process that is about to unfold in your home. Have every detail of the process mapped out before starting work on site. Identify your vendors, make space for storing materials, figure out your building approvals and speak to your neighbors to let them know (including the apartment above and below). This is where BuildingBlox can add significant value to you. For example: When planning a new floor you have to think about materials and size. Depending on the room you’ll have to choose between glossy or non skid tiles. The size of the tile will determine the amount of time it’ll take to install. Grouting between tiles will need to be budgeted for, as well as the PCC layer under the tiles. Our project plan keeps these factors in mind. Make a list of materials required on site and divide them into 3-4 lists based on when they are required on site. For example, if you are redoing your kitchen, you’ll need your floor tiles a lot earlier than your counter stone or chimney, this will help you deal with a manageable amount of decision making, and avoid rushing through selections. Once you have interviewed a few contractors and are ready to hire one, ask yourself this, do you trust them? It is very important that they seem trust worthy to you otherwise the project is sure to be derailed. Once you have established a certain level of trust make it a point to allow them to manage the project in their way and resist the urge to micro manage the process. Payment schedules are key, decide the project amount and make a schedule with dates for the release of payments to vendors, it is advisable to link the payments with milestones so that the contractor is pressured to stick to a work sequence, this way you don’t have to deal with sporadic requests for money. Document all change requests, include budget increase and extra time required, and treat it like a mini contract agreement so that the bill at the end of the project doesn’t surprise you. Also allow the contractor time to plan and execution these changes. Although this might seem like lot of planning for a seemingly simple remodeling project, it will save you a lot of inconvenience as the project progresses, and it’s totally worth the effort.